HARD POP, “DANCE OF THE TRIPEDAL,” PLUS LIBRE DANS SA STRUCTURE. MERVEILLEUSES HARMONIES ET DE BELLES DISSONANCES.LA PRESENCE DU STYLE DE SAM RIVERS EST MARQUANTE TANT DU POINT DE VUE DE LA STRUCTURE QUE DE L’EXECUTION DE CET ALBUM QUI NOUS RAPELLE L’IMPORTANCE QU’A EU SAM RIVERS EN CE MILIEU DES ANNÉES SOIXANTE EN TANT QUE FIGURE DE PREMIER PLAN DE L’AVANT GARDE. UN ALBUM EPOUSTOUFLANT ENTRE AVANT GARDE ET TRADITION DANS LEQUEL FREDDIE HUBBARD, HERBIE HANCOCK ET RON CARTER DONNENT TOUT AUTRE CHOSE QUE CE QUE NOUS POUVIONS ATTENDRE D’EUX AILLEURS À LA MÊME PÉRIODE. 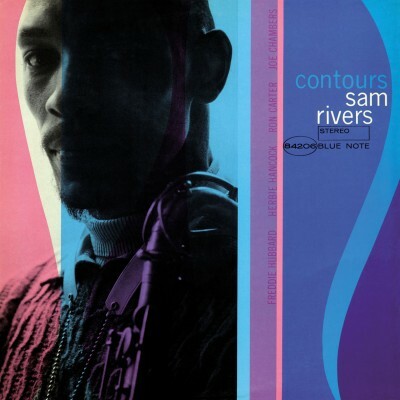 The album “contours” of the saxophonist Sam Rivers has been recorded for Blue Note in 1965 following the album “Fuschia swing Song”. The musicians joining Sam Rivers (tenor & alto sax and flute) are Herbie Hancock (piano), Ron Carter (bass), Freddie Hubbard (trumpet) and Joe Chanmbers (drums). Four vigourous and strong tracks composed by Sam Rivers : “Point of many returns” with a hard pop structure, “Dance of the Tripedal” and “Euterpe” illustrate the sharp and incisive Sam’s style. “Mellifluous Cacophony” is mixing marvellous harmonies with beautiful dissonances. The presence of Sam Rivers’ very personal style is key in the structure as well as in the execution of this record session and reminds us the crucial role that Sam Rivers has played in the mid sixties as one of the leaders of the avant guarde. A staggering record just in between avant guarde and tradition in which Herbie Hancock, Freddie Hubbard and Ron Carter are playing music we don’t hear on their other records from the same period.